The smallest host stadium of Euro 2016 is a peculiar case: it looks almost as it did in 1938 despite so much work carried out inside. OK, we’re exaggerating. It doesn’t look almost like in 1938, but the similarity is just stunning. 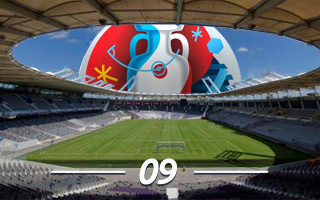 Here’s the story behind the second Euro 2016 venue, Stadium de Toulouse! It was opened in 1937 and due to its historic shape (see below) it’s been nicknamed Mini Wembley for decades. Of course now both stadiums went through a lot of changes and they’re not as much alike, but one more feature that allows Toulouse to compare their ground with Wembley is the heritage. Stadium de Toulouse hosted three World Cups! Even if only two of them were in football (1938 and 1998) and the third in rugby (2007), that’s impressive. It’s been redeveloped several times since opening, particularly in 1949 and 1997, when it gained the current shape. Bud, in fairness, the current stadium retained as much as possible from its 1937 roots. When the French were selected hosts of another great tournament, Toulouse with its population of 1.3 million (urban area) was certain to grab a spot. Again, the stadium was to remain in its current shape, but expanded with an upper tier of seating, able to reach 40,000 spectators. However, price of such changes grew from early estimates and reached over €70 million, causing some controversy. Especially when no professional club in the city required an upgrade of that size. That’s why a smaller plan was implemented, including complete reconstruction of most seating areas and actually reducing capacity to just over 33,000. The downsized redevelopment scheme still consumed over €40 million, but is a very rational plan compared to the extent of changes. Because, even though it seems visually unchanged, the building was remodeled extensively to provide better sightlines and amenities to supporters. West or east bank of Garonne, both are very densely populated in Toulouse, both with very little room for leisure. Still, the stadium is surrounded by green areas and trees thanks to being located on an island (Île du Grand Ramier). Here, accompanied by training fields, swimming pools and exposition center it’s the heart of sports in Toulouse. Also, within walking distance from the center (2.5km) and near the subway. In 1998 its revamped exterior may have seen impressive. Now, left almost unchanged, it doesn’t stand out among other Euro 2016 venues. But it continues what was begun in 1937: the stadium’s outline is virtually unchanged and the simple, clear architecture makes sense especially within the place’s historical context. Despite the cycling track having been removed decades ago, the stadium still has elliptic seating bowl, which means compromised viewing particularly behind the goals. The better it was to see the stands reconfigured during latest redevelopment works to provide more space, comfortable seats and improved sightlines to fans. With capacity listed as 33,000 by UEFA, it’s the smallest Euro 2016 venue. Just like to this day, the stadium will provide weekly use to Toulouse FC and, though less frequently, to the rugby side Stade Toulousain. For the first team size and infrastructure are more than enough even with reduced capacity (16,303 per game for Toulouse FC), while the second team only play their high profile fixtures here, when crowds outgrow their smaller home.